When I found a bag of Mini Reese's Pieces at Wal-Mart, you would've thought I hit the jackpot. I had been looking for them forever and I'm sure that when I saw them, I let out a little squeal of excitement. I purchased several bags and I knew immediately that I wanted to add them to some chocolate cookies. Nothing better than peanut butter and chocolate, right? 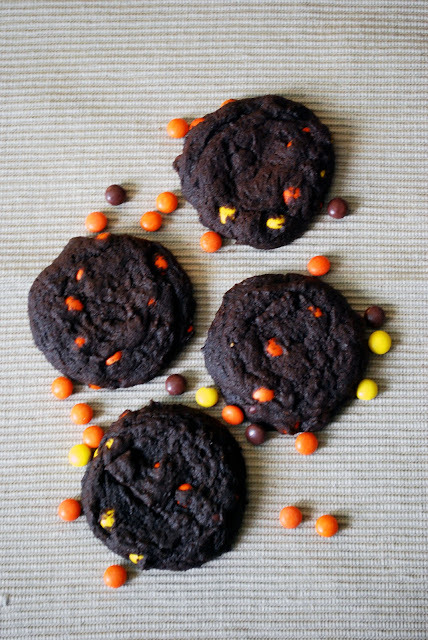 The cookies are soft, but still have a slight crunch, and with the addition of the Mini Reese's Pieces, they really are a wonderful treat...especially with a big tall glass of cold milk. In a medium mixing bowl, combine the flour, cocoa, baking soda and salt; set aside. In a large mixing bowl, cream the butter and sugar. Add the eggs, one at a time and beat well after each addition. Then add vanilla extract. Gradually add the dry ingredients into the creamed mixture. Then add the Mini Reese's Pieces and stir until combined. Cover and refrigerate for about an hour or until the dough is easy to handle. Roll the dough into 1 inch balls and place 2 inches apart onto ungreased baking sheets (Personally, I use parchment lined or Sil-pat lined baking sheets). Bake at 350 degrees for 8-10 minutes or until the edges are firm. Remove the cookies to wire racks to cool. I stored these cookies in an airtight container and they last about 3-4 days. Also, I don't remember how many this recipe made, but I know that it made at least 2 dozen for me. I didn't even know that mini reese's pieces existed! I love reese's, so I know i'd absolutely love these cookies. YUM! I looooove cookies, but only if they're soft or chewy, no crispity cookies for me. And I looooove Reese's. In fact, I'm now tempted to run out to the store + buy some, ha! These look just amazing! MMMmmm - chocolate and peanut butter is always a winning combination. These look so chocolaty! mini reese's pieces? i've never seen them! I adore chocolate and peanut butter and your cookies literally looks perfect. soft, chewy... PERFECTION. Love the overhead shot of them!